CHILI publish introduces a first novelty wave for its flagship solution CHILI publisher, the Universal Graphics Engine. CHILI publisher, the Universal Graphics Engine, streamlines the generation of brand-consistent graphic assets for omnichannel use in marketing campaigns, like personalization and customization. The enhancements establish the solution as a new comparative benchmark in the VDP business segment. This Illustrator® plug-in fulfills a long-standing request from the packaging market. An overall performance increase within the software secures an impressive loading time for a faster and more direct time-to-market for companies looking to increase their conversion rates. CHILI publisher will host 1-1 demonstrations at booth 636 in the South Hall of Print18, Chicago (ILL), USA. Visitors to the PRINT 18 show can book a demo here and now. 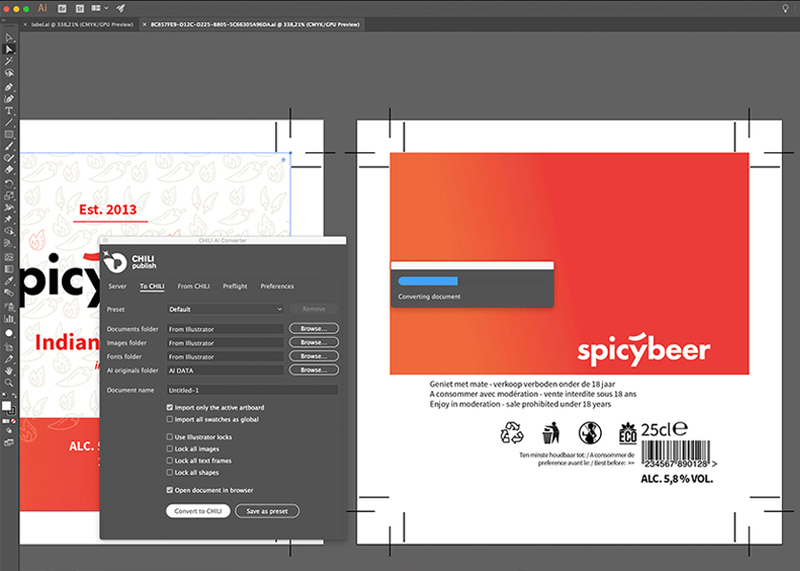 Label and packaging partners have increasingly asked about an Illustrator® plug-in to complete their CHILI publisher integration. The company, therefore, decided to activate the roundtripping loop within the solution for Illustrator® users as well. The plug-in is currently in successful beta-testing and will be made available as a free feature for paid maintenance customers. The update is live and ready to be downloaded by all CHILI publish customers. First-time users who’d like to dry run, can do so on the new and improved SPICY beer portal.